"Rejoice! Rejoice! Emmanuel shall come to thee oh Israel!" Christmas Eve has been a work day for me these past few years, working for the church. We've got a Living Nativity to set up (that's a life-sized nativity scene with Angels, donkeys, and Mary and everything), we've got three services for which to set up, and we've got an entire holiday to orchestrate. Sometimes it feels like we've got to make Christmas happen... and that's a lot of pressure. I don't think you have to work in a church to feel the pressure of "making Christmas" (I can't help but think of the lyrics from Tim Burton's The Nightmare Before Christmas). We can easily get caught up in putting up lights and meeting the deadline for our wrapping... not to mention our shopping. Many Christmas films (including Christmas Vacation, my wife's favorite) highlight with great humor the pressure some people feel to have the best Christmas ever, and we all laugh when it blows up in their face as long as we're ensured a happy ending. 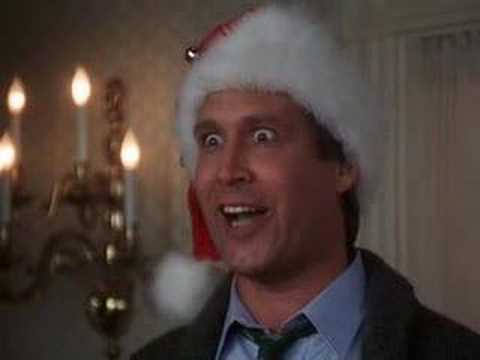 Clarke Griswold just wanted to make it special, but in his desperate attempt to force Christmas to fit his imagination, it all fell apart in his hands. And it took that falling apart for him to truly discover Christmas. Sure, some of us have had better luck than Clarke in making Christmas happen. But I love to look at the words to that old Christmas hymn, "Oh Come, Oh Come Emmanuel." It says "Rejoice! Rejoice! Emmanuel shall come to thee oh Israel!" It does not say "Rejoice! Rejoice! 'Cause with enough effort, you can make Christmas awesome, oh Israel!" Part of the Advent season is realizing that it's not in our hands. We cannot force Christ to come and we don't even need to. Christ simply comes to us. God's healing and redeeming presence joins our side regardless of what we might do to try and make it happen. No amount of holiday cheer can deter or hasten Christ's coming. So with all our efforts, perhaps the only task for us to do is not a task at all but a discipline. Perhaps the best way to celebrate Christmas is to simply offer and open up a space for it to come to you--to let yourself be chosen, to let yourself be dependent. As much as I love the "Little Drummer Boy" story where the poor guy doesn't have anything to give so he just tries his darnedest and hopes it's good enough. Perhaps a better image for us to image is the image of Mary, a young scared Jewish girl, responding to the surprising decision of God to use her with a patient, "may your word to me be fulfilled" (Luke 1:26-38). This Christmas, may you be discovered by Christmas. May you lay down your arms and allow yourself to be vulnerable to the light that shines in the darkness. May you find enough rest, enough space, to simply cease and say, "may your Word to me be fulfilled."